2015 Laurent Herlin, Bourgueil Rouge, Illuminations, Loire Valley, France. 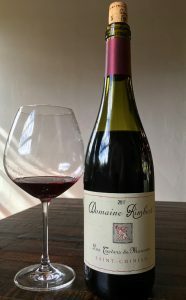 The 2015 Illuminations Bourgueil by Laurent Herlin is a unique Cab Franc with lots of interesting fruit and spiciness showing an almost Chinato like herbal frill and a juicy palate of strawberry, cherry and vine picked red berries. Takes a few minutes in the glass to fully open to reveal more familiar Franc elements with some briar, bell pepper and racy currant coming through in this garnet/crimson red wine. A touch of earthy/funk, stemmy like bramble and earth shows up as well, along with wild flowers and chalky too in a subtle way that adds complexity to this medium bodied, easy drinking Loire Valley Cab Franc, with everything folding in nicely to make for a playful version of this grape. As mentioned recently in my review of this estate’s sparkler, Laurent Herlin is new to most Americans, the Herlin wines from France’s Loire Valley are all natural bottlings that mostly are Cabernet Franc based , using grapes from in and around the classic area of Bourgueil. All farmed now according to biodynamic principals and with vines on a mix of sand, gravel, silicieous clay, limestone and tuffeau soils. 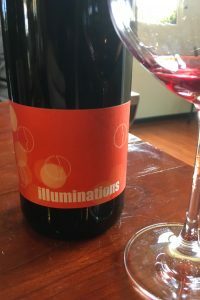 The Illuminations, 100% Cab Franc, one of Herlin’s Bourgueil offerings, is native yeast fermented without any sulfur additions and aged for 12 months in only (neutral) old oak barrels. Laurent Herlin, who has been working without chemical inputs since 2009 is working to Demeter standards, and is a welcome new face to our (USA) natural wine scene with his serious and soulful, but fun wines. This 2015 Illuminations drinks well and could get better with another 2 or 3 years in bottle, I will enjoy seeing where it goes and don’t forget Herlin’s Cintre Sparkler, which is a lovely Pet-Nat. 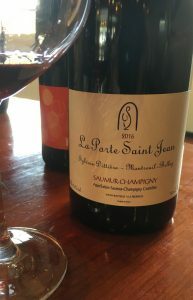 2016 Sylvain Dittiere, Saumur-Champigny Rouge, La Porte Saint Jean, Loire Valley, France. One of the Loire’s rising natural stars, Sylvain Dittiere, works his 4 hectares all organic, and as his importer notes, comes armed with formal schooling and a remarkable “un-training” from some of the best natural winemakers in France, such as Marc Tempé in Alsace, Gérard Gauby in the Roussillon, Thierry Germain and Antoine Foucault in Saumur, of Clos Rougeard fame. Sylvain Dittière struck out on his own in 2010, at the ripe age of 25, when he acquired a 2.5 ha parcel of Cabernet Franc in Saumur-Champigny that had already been farmed organically and a gem of “jurassic” cellar that was carved out of the rock. This environment enables him to work without temperature controlled tanks or or vats and it is all fed by gravity flow for ultra gentile handing of the grapes and wine. 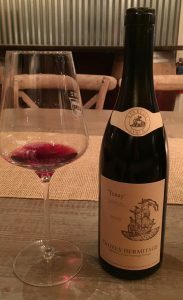 I have been a fan and follower of Dittiere’s wines, especially this bottling since his 2013 vintage, this La Porte Saint Jean Saumur-Champigny, 100% Cabernet Franc, is a Loire classic in the making, with subtle earthy and gamey tones and amazing depth of flavor and complex layers of fruit, texture and savory notes. This 2016 is deep with a touch of reduction and leathery notes, maybe from a bit of brett (Brettanomyces)?, though the fruit comes through to cover it making for a classic, old school style Cab Franc. Layers of currant, black cherry, plum and earthy blackberry fruits come through forcefully on the medium/full palate along with hints of spicy herbs, loam, cedar, dusty chalky elements and mineral notes. With air everything comes together in this young Cabernet Franc and the structural tannins smooth out allowing this Saumur-Champigny to show it’s best qualities, this is a beautifully authentic and well crafted wine of old world class. 2017 Saint Cosme, Cotes-du-Rhone Rouge, Rhone Valley, France. Louis Barruol’s famed Gigondas estate, Chateau de Saint Cosme is the most ancient estate in the region, located on the site of an old Gallo-Roman villa, which very probably already had vines of its own. The estate’s existence in 1416 has been clearly attested by a document mentioning the granting decree by Jean de Chalon, Prince of Orange, with the Barruol family ancestors taking it over in 1570 and making it one of the great wine producers in the Rhone, with Louis Barruol himself taking it to the top tier of the wine world. Making primarily cru Gigondas, Barruol also makes a wide range of region wines, both north and south and has shown a wonderful touch with Syrah, doing fabulous Cote-Rotie, Crozes-Hermitage and Saint-Joseph as well as this 100% Syrah Cotes-du-Rhone. Saint Cosme’s Cotes-duRhone, grown on a mix of soils, including red clay, pebbles and limestone sands all hillside vines is partial whole cluster and all tank raised. Always a wine of value and purity it gives a ton of character, personality and never disappoints in any vintage, and this one is an exceptional year. In 2017, low yields produced wines with lots of intensity and depth with hedonistic density, but with vibrant fresh detail, with what Barruol notes, adds crunchiness and salinity to this beautiful red wine. This 2017, which is an amazing follow up to the great 2015 and 2016 versions that I loved, delivers boysenberry, sweet blueberry and plum fruit as well as savory spices, a touch of meat, black licorice and a inner perfume of violets and lavender. Rounded tannins give structure, making this wine perform at a higher level than one would expect and this vintage in particular will age well, maybe a decade or more, impressive for the price! 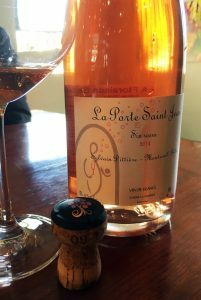 2014 Sylvain Dittiere “La Porte Saint Jean Six Roses” Méthode Champenoise Sparkling Rosé, Loire Valley, France. Domaine Sylvain Dittiere, founded in 2010, is an all natural/organic estate in Saumur-Champigny focused on Cabernet Franc wines, and after being mentored by two legends, Thierry Germain and Antoine Foucault of the fabled Clos Rougeard, Sylvain has gained quite a reputation and has a cult like following. Apart from his earthy and dense Cabernet Franc reds, comes his delicate and intriguing sparkling wine. Imported by Floraison Selections, Sylvain Dittiere is a star, I love his Cabernet Franc, especially his Saumur-Champigny Rouge, La Porte Saint Jean. The Dittiere Six Roses Sparkling Rosé, which is crafted using the Champagne method, and is aged 2 years before disgorgement. Dittiere blended Chenin, Sauvignon Blanc & Cab Franc from the 2014 vintage for the base wine and uniquely macerated it with rose petals. This bubbly, could hardly bring anymore of a sensual image to mind, especially if you let your mind wander, it would seem to be pure seduction in a bottle. A lot of thought and work went into this gorgeous dry Rosé méthode champenoise sparkler, that was disgorged in 2017, and it offers a ton of quality for the price, it is really drinking well right now. This is pretty stuff with a fine and yeasty mousse and lightly perfumed with hints of rose oil, impressive for it’s balance and depth of flavors, it’s far from a gimmicky thing, it shows wonderful finesse and class showing bright intensity and crisply dry bubbly. The palate has a mix of citrus, stone and red fruits with a lemon burst, strawberry, sour cherry and hint of peach with a brioche/leesy note adding elegance along with a touch of mineral, spice and wet stone. While Sylvain’s reds are raw, masculine and earthy, his Sparkling Rosé is lacy, seductive and brilliantly feminine, drink this anytime and anywhere, it’s wonderful as an aperitif and surprisingly good with sushi and lighter cuisine. 2015 I. Brand & Family Winery, Cabernet Sauvignon, Monte Bello Road Vineyard, Santa Cruz Mountains. Ian Brand’s 2015 Monte Bello Road Cabernet Sauvignon, Santa Cruz mountains, is what you get when you respect great terroir and follow a traditional path of winemaking, it captures the essence of place perfectly with a subtlety that is almost lost in the modern world of Cabernet Sauvignon, Brand’s effort is more along the lines of the famous neighboring winery to this vineyard, Ridge Vineyards, as well as Mount Eden, Corison and Phillip Togni, which should tell you just how good his effort is! After working a few vintages with this vineyard and its farming, Brand has fine tuned everything and makes for a wine that has purity of fruit, richness of palate and graceful balance, he was able to get wonderful ripeness, density and length with low natural alcohol, in fact at around 13% and the hillside fruit’s power you get an almost perfect Margaux like quality, as I noted with his last vintage of monte Bello Road, and it reminds me of the early nineties in style, making for a stylish, age worthy and energetic Cabernet Sauvignon. Grown at close the 2,000 ft on red Franciscan series soils with limestone the Ian Brand Monte Bello Road Cabernet Sauvignon comes from vines that were planted mostly in the nineties at Fellom Ranch with a warm eastern exposure allowing for warm daytime temperatures with a large diurnal change from day to night, which aids in retaining acidity. This area is prime Cabernet country and is an outstanding individual place for these grapes, as Ridge has proven for many decades. This unique hillside terroir rivals any in the world, not just the state for complex and depth, this is great dirt for Cabernet Sauvignon and Ian has crushed it with this 2015. The beautifully detailed, deep opaque garnet/purplel I. Brand & Family Monte Bello Road Cabernet Sauvignon really puts on the charm right out of the gate with acacia flowers, dark berries and whiff of cedar before leading to a youthful firm medium full palate of structured form and poise with layers of black currant, plum, blackberry and kirsch, along with hints of sandalwood, licorice, sweet tobacco leaf, summer sage and faint vanilla and spicy note. 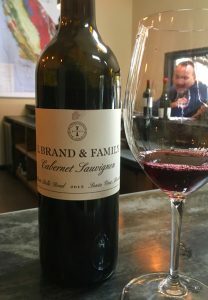 Made with an exceptionally deft touch, this 2015, from a warm vintage shows a fresh vigor and lightness that is gorgeous in the glass, and while stunning even now, I think it promises much more in the future, I look forward to try this Cab again, in 5 to 7 years, and while the 2014 seems amped up and more dense, I think the 2015 has the stuffing to go 15 to 20 years. Ian and his team have been getting lots of critical acclaim, and especially the recent Winemaker of the Year award from the San Francisco Chronicle, all which are well deserved for this small hardworking family winery. Being close to his facility and able to run into him often has been great to get an insight into his passion and dedication, for which I’m grateful, it has helped me see where there regions, of Monterey, San Benito, Santa Clara and Santa Cruz Mountains, are going with this great set of young winemaking talents that are pushing these areas forward with a new vitality and driven focus. Ian Brand, a vineyard whisperer, has discovered a few old vine sites and guided them into stardom, including the site where this wine comes from, but also the Besson Vineyard for Grenache, Bayly Ranch for Cabernet Franc and the Enz Vineyard for old vine Mourvèdre. All of which are must have wines, released under his signature line, they are do not miss limited production offerings, that showcase authentic character and place, they are California history in the bottle. 2016 Barruol-Lynch, Crozes-Hermitage Rouge “Tenay” Northern Rhone, France. The two barrel Tenay cuvee, both from the lieu-dit of the same name, Crozes-Hermitage by Barruol-Lynch is a polished effort with distinct wood presence in this 2016 and loads of ripe fruit, making it a bit unique, it is almost Aussie like at first, but does unwind nicely gaining the classic granite based soil character with air, though lacking the aromatics of vintage at this early stage. 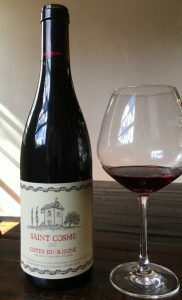 After having the Saint-Cosme Crozes recently, I must admit to be somewhat disappointed by this version of which I had so much hope for, though that said it is a well made and offers a lot of Syrah for the money and it has pleasing depth of black and blue fruit that shows detailed flavors and mouth filling hedonism. There is also the expectation of evolution over the next three or so years in bottle. The Barruol Lynch project may seem strange, considering they, Kermit Lynch the famed importer and Louis Barruol the owner winemaker at his Chateau de Saint-Cosme, are in almost every sense competitors, but such is the respect for each other the two have, it not only works, it thrives and they have found a complete separate niche into which to join forces. Over the last five or so vintages the range has expanded beyond the original Cotes-du-Rhone into this series of wines work for both parties, that includes a set of Cote-Rotie, a Saint-Joseph and three Crozes-Hermitage-Hermitage(s), with this Tenay being one. Kermit Lynch, the American importer and wine crazy pioneer, who owes the Gigondas domaine of Les Pallieres and who brings in the famous Vieux Telegraph wines of Chateauneuf-du-Pape, is very much involved in creating each cuvee, sometime hand picking barrels or helping in blending trials. This under the radar lineup deserves attention and it is worth searching them out, in particular the Cote-Rotie bottlings, I especially like the Neve and La Viaillere, both stellar values and beautiful wines. The 2016 Tenay, coming from 30 to 50 year old vines, as mentioned set on pure granite soils, was all hand picked and carefully sorted, and with the Barruol-Lynch practice of using only about 10% whole cluster and only used barrels, with this 2016 getting about a 3 week maceration and cement tank fermentation. The evevage lasted close to 15 months in the 1 and 2 times used barrels and it was bottled unfined and unfiltered, which may explain the more sweet and toasty oak presence at this point. The profile stays dark on the rich palate and it is lovely deep in color in the glass showing a bright garnet edge and an opaque purple core, very traditional 100% Syrah in look and feel, it just is missing the classic violets on the nose, keeping it from being a true great, though I could be eating my words in a few years, I hope it’s potential is realized as it does have a ton of class and length. The layered fruit includes blackberry, boysenberry, plum and a mix of kirsch and cassis elements, along with vanilla, smoke and cedar notes as well as subtle spice, fig paste, mineral and anise. Ultra refined and with seductive density there is plenty of pleasure on offer here, I’d hold it for a few years more to allow it to mature, best from 2021 to 2028, and be sure to have with robust cuisine, especially if you open it sooner. 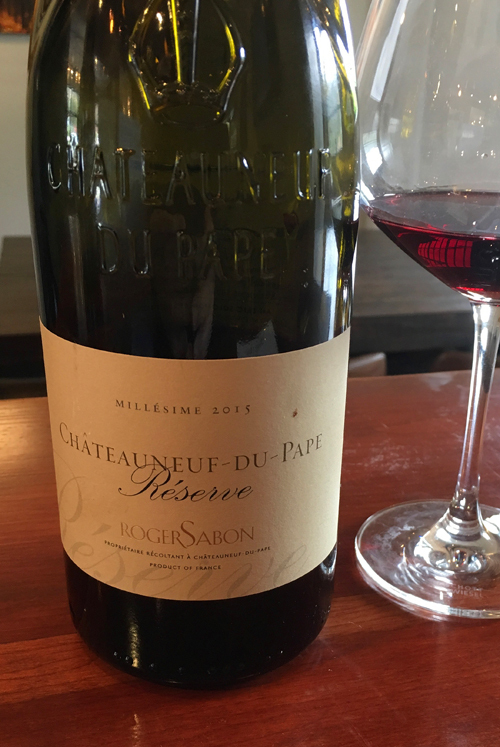 2015 Domaine Roger Sabon, Chateauneuf-du-Pape Rouge Reserve, Rhone Valley, France. The powerful and ripe vintage, 2015 Reserve Chateauneuf from roger Sabon, is full of intensity and earthy/meaty depth with tar, melted black licorice and dark berry fruits all grabbing your immediate attention on its full bodied palate before the more subtle of complexities show up. Made from a field blend and barrel selection of Grenache, Syrah, Mourvèdre and Cinsault this cuvee shows a lot more of the leather and gamey (I usually associate with a high percentage of Mourvedre) side of Chateauneuf at first, though the plummy Grenache and Syrah florals do come through with air in this tightly wound red. As importer Eric Solomon notes, the Sabon family is an ancient and well-regarded name in Châteauneuf-du-Pape, first mentioned in documents dating all the way back to 1540, with the family, under Seraphin Sabon, first bottled their own wine in the appellation under the family’s name in 1921, just before Chateauneuf became France’s first AOC in 1929, and his son Roger founded his own Domaine Roger Sabon in 1952, just before Chateauneuf-du-Pape rocketed to fame after the historic 1959 vintage. Currently run by Roger’s sons Denis and Gilbert, the Domaine’s wines are made by the talented Didier Negron, who has returned the wines to a more traditional place, doing away with the new small French barriques in favor of cement vat ferments and aging in more neutral foudres and some, as with this cuvee Reserve, demi-muids in the elevage of the reds. Sabon owns 18 hectares in Chateauneuf with most of their holdings located in the northeastern part of the zone, where the soils are sandier with a high concentration of limestone, which powerful and ripe Grenache loves, though they also own a few parcels in the legendary Le Crau zone, like Vieux Telegraph, which famous for its red clay under a deep layer of galets, the iconic round river stones that Chateauneuf-du-Pape is known for. Actual grape, or Cepage, breakdowns details are sketchy at Domaine Sabon, as the Sabons are shy about divulging any information about any given wine, though they admit their Grenache plots have some vines over a hundred years old and some of their Syrah is at least 50 years old, and besides those and the Mourvedre, they also have Cinsault, Terret Noire, Counoise, Vaccarèse, Muscardin, Roussanne, Clairette, Bourboulenc and Grenache Blanc vines, and this Reserve includes some of the Cinsault that adds a fresh vein the cuts into the density. This 2015 Reserve gets prettier and more polished with every minute of air, unfolding layers of boysenberry, damson plum, kirsch and creme de cassis, but also allowing a savory side to contrast with the loaded fruit with tobacco leaf, peppercorns, garrigue and charcoal embers. At 14.5% alcohol, on the label, this wine is no wimp, but has a finessed and mineral quality to it, it is a serious version with an elegant streak to it as well, look for it to drink well for at least another decade. I can only imagine how great the 2016 edition will be, which should eclipse this brilliant effort and looks to be a classic vintage in the Rhone. 2011 Domaine Guiberteau, Saumur Blanc, Clos des Carmes, Monopole Breze, Loire Valley, France. The remarkable fresh and vibrant 2011 Clos des Carmes Monopole Breze is full of life with ton of reduction to start before opening up to it’s pure Chenin character with gritty flint rock, matchstick and steely mineral coming through on the nose, very reminiscent of an old school Puligny-Montrachet with lemon and pear fruits showing in the background. This is a wine to take your time with, it will not work to a timetable, give it air and enjoy the ride, it is a white wine that behaves more like a firm red wine in the glass, it’s quite extraordinary to say the least, and you’ll need food to get the soul of this glorious Chenin Blanc to reveal itself, at least some soft creamy cheeses. Romain Guiberteau, who works all organic, is like the Raveneau or Roulot of Saumur, handcrafting intense and lively wines, especially his whites, which are mostly all non malo and vivid with brisk acidity, making him one of the hottest winemakers in the Loire. Breze is like the Batard-Montrachet of the Loire, and especially Saumur, which is a region in the spotlight, and Romain’s version from Clos des Carmes is a special walled vineyard which is planted to a massal selection of Chenin Blanc clones. It was Romain’s grandfather who acquired this historic parcel on the hill of Brézé back in 1955, and it is, as importer Becky Wasserman notes, one of the three clos of Brézé classified as “Très Grands Vins de Saumur” by Maurice Edmond Saillant, the renowned Loire expert. The 2011 Clos des Carmes, which is set on a south-facing site set on clay and silted soils was whole-cluster pressed and barrel fermented using only indigenous yeasts without malos, as mentioned, and aged on its lees for 18 months, the French oak used was not new, mostly 1 and 2 year old casks. This vibrant and slow evolving cuvee is only from the absolute best vines and barrels, anything not living up to Romain’s high standards gets declssified. 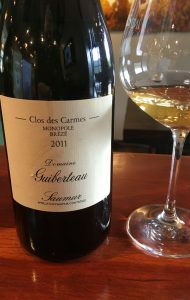 These 2011 Clos des Carmes Saumur Blanc by Guiberteau adds preserved citrus, wild peach and golden fig fruits, wet stone, a touch of herb and light toast in the glass and its ultra clear pale hue shines, making it seem much younger to the senses than the case. The only problem with these uber geeky Guiberteau(s) is the price, which makes exploring them less attractive when compared to white Burgundy even, but certainly Chenin fans will pony up for these wonderfully hand made unique, intriguing and rare wines. 2017 Domaine Rimbert, Saint Chinian Rouge “Les Travers de Marceau” Languedoc, France. One of my favorite Languedoc wines, the Domaine Rimbert Carignan based Les Travers de Marceau is a beautiful and fresh Rhone like offering that satisfies the senses with purity of terroir driven fruit and a playful character as well as serious complex array of mineral and spice. Jean-Marie Rimbert, self proclaimed defender of the Languedoc’s native Carignan grape, is a benchmark grower for the region, he is a “Carignanista” and his Saint Chinian Rouge Les Travers de Marceau is a delightfully pure and fresh red. This cuvee is mostly Carignan, but with some Syrah, Grenache, Cinsault and Mourvèdre to add complexity and depth. Jean-Marie ferments this Les Travers de Marceau with native yeasts, almost no sulfur with primary and secondary done in tank with no oak. Rimbert’s importer, Floraison Selections, notes, with his low yields (30hl/ha max, often less), intimate knowledge of his individual parcels, and delicate extractions (punchdowns), he brings out undeniable delicacy, nuance, elegance as well as ageability in these wines. Both his AOC and VDF bottlings alike brim with energy and fresh detail, especially this Les Travers de Marceau. The 2016 was absolutely delicious, so I was full of expectations of this 2017, and lucky for me and the world it is just as good with lovely ripe fruit and wonderful purity along with a clean intensity of form, it is lively and vivid with black and blue fruits leading the way. This dark fruited and spicy 2017 Saint Chinian Rouge by Rimbert flows with easy to love and drink flavors, it shows blackberry, plum and juicy sweet currant fruits along with a touch of pepper, mineral and floral tones as well as a touch of anise, earth and lavender. This Languedoc red has the personality and naked focus to go great with many cuisine options and is a wonderful drinking old world wine with a sense of place, and its brightness makes it good with a BBQ or picnic quaffing. This dark purple/garnet wine is medium weighted and has plenty of class, it is a nice value too, especially those that like old vine Carignan, drink this over the next 2 or 3 years. 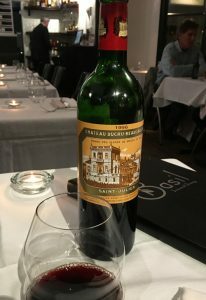 1996 Château Ducru-Beaucaillou, Second Growth, Saint-Julien, Red Bordeaux, France. After holding this bottle for almost a decade, I just couldn’t wait any longer to pop the cork on this Ducru-Beaucaillou 1996, and I found it was in a lovely place and drinking fabulous with a distinct core of beautiful dark fruits that is fresh, but having the pretty maturity that age brings with tannins holding firm still, but allowing graceful textures and complete enjoyment. After Château Léoville Poyferré, which has become since 2001 one of my secret favorite Bordeaux(s), Château Ducru-Beaucaillou is one of the best Saint-Julien producers and has a long proven track record that while has a few blights along the way is pretty reliable for stylish and refined wines. The estate, owned since 1941, by the Borie family, who purchased the historic Château Ducru-Beaucaillou and vineyards during the early part of WWII, with the wines having been produced here of enough quality to be classified as one of fifteen Deuxièmes Crus (Second Growths) in the original Bordeaux Wine Official Classification of 1855. The origins of Château Ducru-Beaucaillou dates back to 1720 to be precise, before Bertrand Ducru bought the estate and added his name to it, It owes its original name to the “beaux et gros cailloux” – the beautiful stones, referring to the gravelly soils of the outer Medoc. Château Ducru-Beaucaillou is now run by Bruno Borie, who’s family also owns two other premier estates, Château Grand-Puy-Lacoste and Château Haut-Batailley, both in the Pauillac region, all of which are Cabernet Sauvignon dominated, with Ducru-Beaucaillou being 70% Cabernet Sauvignon and 30% Merlot, with their vines being close to 60 years old on average. The Grand Vin of Château Ducru-Beaucaillou, according to the winery, is aged for 18 months in 50% to 80% new oak barrels according to the richness of the vintage, and I would guess this deeply colored1996 had the lower range of new wood as it doesn’t show any remnants of the new oak, being fined with egg whites and only lightly filtered before its bottling. All is done with the purpose to allow the more delicate natural to shine through here, while allowing the Cabernet Sauvignon to make its presence felt on the palate. This 1996 vintage, now in 2019, is a study in purity and is everything we want in a left bank wine, showing finessed layers of blackberry, plum and cherry fruit along with hints of creme de cassis, loamy earth, cedar as well as dried flowers, loose tobacco leaf, anise and a touch of leather. The Merlot has added a smooth density and mouth feel, it’s presence working perfectly to fill out the wine, playing second fiddle to the Cabernet Sauvignon is no shame in a wine this elegant and well crafted, it’s very impressive and should drink well for another half a dozen years.